Today is the Blog Blast for Peace (background information can be found HERE). 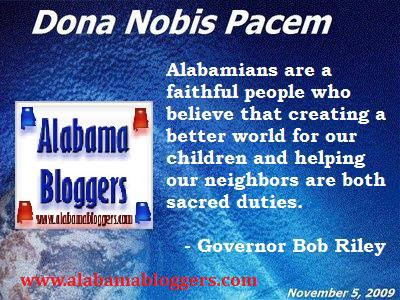 I am thrilled that Alabama Bloggers will represent our state in a movement that has world wide participation. It is a good day to be an Alabamian. Current Alabama Governor Bob Riley once said, "Alabamians are a faithful people who believe that creating a better world for our children and helping our neighbors are both sacred duties." I interpret this to mean that creating a better world starts at home. It starts with me. Just as peace starts with me. The way I treat my family, my neighbors, people in the community, a stranger on the street... these are all crucial elements to peace. To find other participants for the Blog Blast for Peace, please visit it's founder Mimi Lennox. If YOU are participating in the Blogblast for Peace, link up here! Great way to represent your proud state. Glad to have fellow southerners contributing to such a great cause. Hw cool to represent a state in the BlogBlast. Peace to you! Peace comes from the little things we do in every day life, it spreads through a community. Wouldn't it be neat if all the stated did this... and then all the countries? Thanks so much for bringing the movement to a wider audience. This is a wonderful way to represent your state. Peace to you and yours. Welcome Alabama Bloggers! Thanks to Jennifer @ Dust Bunny Hostage for alerting you to our cause. We are thrilled you decided to join us this year. Your peace globe is awesome with the Governor's quote on it. Best Christmas Trees in Town? Giveaway!! Gift Certificate to The Depot! Winners to Mad Tea Party Giveaway! Reminder: TOMORROW is the Blogblast for Peace! Holiday House Showcase in Birmingham! Link Up Your Halloween Photo Posts! !